Matt Renshaw is set to remain on the sidelines for the second Test against Pakistan. AARON Finch's pleasure was Matt Renshaw's pain when the former earned his Test debut against Pakistan last week. The 31-year-old's call-up consigned opener Renshaw to the sidelines - a place he is set to remain for the second Test starting Tuesday (5pm AEDT). But Renshaw's fellow Queenslander Ian Healy believes the opener remains firmly in the Test equation, despite another snub. Denying Renshaw is becoming Australia's forgotten man under Justin Langer, Healy said there is a simple reason behind the 22-year-old's omission. "Renshaw might not be aggressive enough at the top of the order for their liking. 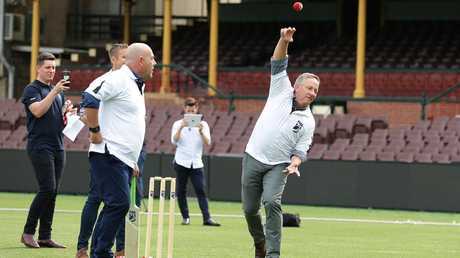 I think that's what they've got planned for Finchy (Finch), who can take it to the new ball bowlers and get them before it starts reversing and spinning," Healy said on Tuesday. "I'd say they just ruled him out on that front. They fancy Finchy to do that job so Reners (Renshaw) misses out. "I definitely think he'll be in the [Test] equation. He's very young and still has plenty of time to be involved." Renshaw has played 11 Tests for Australia (636 runs at 33.47) and was the Sheffield Shield’s highest run scorer last season (804 runs at 44.66). Renshaw has played 11 Tests for Australia (636 runs at 33.47) and was the Sheffield Shield's highest run scorer last season (804 runs at 44.66). 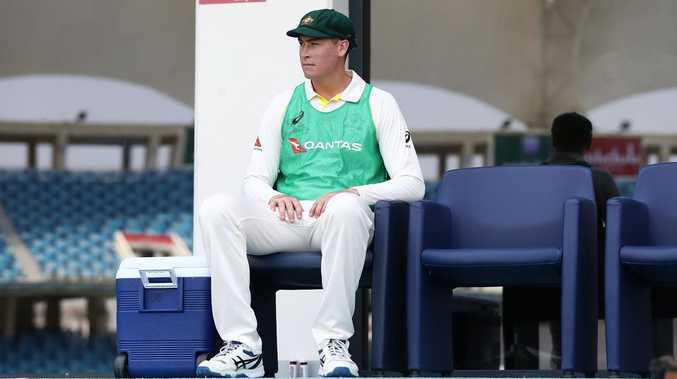 Nonetheless, Queensland teammate Marnus Labuschagne - who was the Shield's second-highest scorer (795 runs at 39.75) - was tossed a baggy green cap in Langer's first Test in charge. Labuschagne only made scores of zero and 13 batting at No.6, but took a wicket in each of Pakistan's innings. Healy said the 24-year-old should keep his spot, instead of reintroducing Renshaw as an opener with Finch, and moving No.2-No.5 down a position. "You don't drop Marnus - 'one match and then you're out'. They've done that too often over the last 15 years," Healy said. "He needs to be given a bit of a longer tenure and, of course, he can bowl." Denying Renshaw is becoming Australia’s forgotten man under Justin Langer, Ian Healy said there is a simple reason behind the 22-year-old’s omission. Healy added: "I reckon [Renshaw hadn't played enough]. He was just a bit light on for the really tough cricket that they have to play." Renshaw's competition is only set to increase though, with Cameron Bancroft less than three months away from completing his nine-month ball-tampering ban. Healy said he doesn't expect Langer to favour Bancroft despite the pair forging a strong relationship at Western Australia. Instead, he thinks Langer's "culture of performance" will force the selection of Renshaw - but only if he delivers in the early stages of the Sheffield Shield. "What Langer will be setting up is a performance culture. 'I'm not pushing anyone in without performance'," Healy said. "So whether it's Bancroft or Renshaw, you get back to first-class cricket and you perform. "Make big hundreds - which both players have done at first-class level - and be ready and in the best form of anyone in the country when Langer might need someone else." Renshaw is expected to be flown home this week to play for Queensland. Although, Healy said Renshaw would still benefit from carrying the drinks in the second Test. "The value of Renshaw staying there and doing some hard yards, lots of practice and maybe helping that team win a series for the first time over there, is huge. So I wouldn't undervalue keeping him there. I'd prefer to see that. "I'd like to see young players like that stay and enjoy the fruits of a lot of hard work." Renshaw would still be available for Queensland's second-round fixture against South Australia if he stayed in the UAE for the remainder of the Test series.